After the Soviet Union collapsed at the end of 1991, Sino-Soviet relations became Sino-Russian relations. For more than twenty years, these relation ns have developed extremely smoothly, and the leaders of both countries consider today’s relations to be better than they have ever been historically. Many factors have propelled these relations forward, but the most important are internal factors in the two countries, and, of the external factors, the US factor has played an especially important role. Second, they have established regular, high-level summits and exchange mechanisms at other levels. China and Russia have established a mechanism for regular summits of heads of state, heads of government, and leaders of parliament. Under the rubric of the mechanism for regular presidential summits, China has formed committees for summits, cooperation in personnel exchanges, and energy talks as its three main mechanisms, and under these, subcommittees and working committees are continuously proliferating and covering all areas of Sino-Russian cooperation. Within China’s foreign cooperation apparatus, these have the highest specifications, the most complete organizational setup, and the mechanism for summits and exchanges that touches on the widest range of areas. China has nothing like this with another country, and, globally, this is a rarity. Third, the treaty of good neighborly, friendship, and cooperation was signed in Moscow on July 16, 2001, incorporating the main principles, spirit, and results of bilateral experience over the past ten years, to define in legal form the peaceful thinking of the two nations to have “friendship for generations” and to avoid “eternally being enemies.” It is worth noting that the sixth treaty clause establishes for bilateral relations’ most sensitive border problem that neither side has further territorial demands and the ninth clause that stipulates that if either side considers that peace can be threatened or its strategic interests affected, the two sides will immediately start contacts and talks. If this clause is fully observed, bilateral relations would be able to enter an alliance status. Fourth, after establishing the Shanghai-5 in 1996 and the SCO in 2001, China and Russia have seen the SCO become an independent force in international relations. It plays a distinct role in responding effectively to cross-border threats and challenges, while also advancing cooperation in security, economic ties, and other spheres. Fifth, China and Russia have completely resolved the lingering historical, border problem and forged a foundation for generations of stable relations. In doing so, they have reached a situation in which no political problem any longer exists between the two countries. Sixth, in the five-state agreement of April 1996 China joined with Russia, Kazakhstan, Kyrgyzstan, and Tajikistan in making the border area transparent and non-militarized. Along a 7300km border, limits were set on troops at 134,000. They agreed to inform one another of all military activity within 100km of the border. This border demilitarization and transparency about military movements, among other things, reduced the chance that military disputes linked to Central Asia would become an issue in Sino-Russian relations. Seventh, cooperation in the military area has continuously increased. Russia continuously has served as an important source of advanced arms for China. Not only has China purchased advanced airplanes, submarines, surface vessels, missiles, etc., it also has purchased the rights to advanced military production technology. Beginning in 2002, the two countries have conducted joint military exercises on land and at sea, which have deepened mutual trust, while strengthening coordination in defense security at the same time that it raises their capability of jointly responding to new international or regional challenges and threats. Eighth, economic cooperation has achieved breakthrough progress. Trade reached US$88.1 billion in 2012, and it is forecast to hit US$100 billion in 2015 and US$200 billion in 2020. In 2011 the Chinese branch of Russia’s ESPO pipeline started to transport oil, reaching an annual rate of 15 million tons. In March 2013, when Xi Jinping visited Moscow, a new energy cooperation memorandum was signed that will raise the annual total to 50 million tons. From 2018, Russia will also deliver to China through a pipeline 38 billion liters of natural gas, eventually reaching 60 billion. Russia has opened a new energy market, even as China has diversified its supplies, ensuring the economic security of both, which has enormous strategic significance. Ninth, in the international arena, there has been close cooperation, indicated by joint statements in 1997, 2005, and 2008. China and Russia have vast common concerns and interests, achieving outstanding results from cooperation in preserving the authority of the United Nations, resolving regional hot spot problems, containing US unilateralism, etc. They have worked together to establish regional and multilateral organizations, such as the SCO and BRICS. At the United Nations, the G20, and other international venues their close collaboration has advanced a multipolar world and democratization of international relations. Tenth, the social foundation for Sino-Russian cooperation has continuously expanded. From 2006, to increase mutual understanding and friendship between the two peoples and deepen the social foundation for the relationship, there has been a succession of years with large-scale, organized activities, such as years of youth friendship and tourism. In Chinese public opinion, Russia repeatedly stands in the ranks of friendly countries, while China’s image in Russia has continuously been improving, and the mainstream views it as a friendly country, holding an approving attitude toward its development. The Sino-Russian strategic, cooperative partnership is different from alliance relations of the past half century, and is a new type of relationship in the following characteristics. First, as leaders of the two countries repeatedly assert, it is characterized by mutual respect, and equal treatment. The people of each state have the right to proceed from their own national circumstances without outside interference, independently choosing their own social system, development path, and model. In their exchanges each preserves its own dignity with neither having any sense of humiliation. Second, the two support each other in regard to national sovereignty, territorial integrity, and other core interests. The contents of their partnership include: continuous deepening of strategic trust, increasing mutual political support, firmly backing the other’s path of development in accord with national circumstances, firmly backing the other’s security and development interests, especially core interests, closely cooperating on international and regional questions, and sparing no effort to promote a multipolar world and the democratization of international relations. Third, the two are committed to establish a new outlook on security and building a new security system. They have discarded Cold War logic and the Cold War model, refusing to again follow the route of an arms race and the old path of forging military alliances. Instead, through arms control and mutual trust they seek joint, equal security. Fourth, agreeing on not to form an alliance and not to direct their ties against a third country, the two states do not require unanimity on all international questions. For instance, in 2008 in the war between Russia and Georgia, China did not support the independence of Abkhazia and North Ossetia, and in China’s disputes over islands with Japan and some Southeast Asian states, Russia is not taking sides. Their partnership has no hypothetical enemy or latent opponent. On the one hand, they cooperate closely in containing US hegemonism. On the other, they both strive to develop constructive relations with it. Leading officials and academics have reached the following consensus from the lessons of past relations of first alliance and the opposition between Beijing and Moscow: if there is harmony, it is in the interest of both; if there is conflict, both sides lose. One does not choose one’s neighbors. China and Russia are two large neighbors that have no choice but to get along for mutual benefit. There are three points to be made in support of this. First, domestic reform and development requires this. For a long time to come, both states need to concentrate their energies on this in order to realize national rejuvenation. The central diplomatic task for both is to maintain a good international environment, and this starts with peace and stability along their borders. Through establishing the strategic, cooperative partnership with Russia and the SCO, China has turned its northern and western borders into reliable backyards. Russia has done the same with its eastern and southeastern borders. Each country is the other’s rear area. Second, both have been putting in place market economies and open door polices to the outside, while striving to become part of the process of economic globalization. Geographically, they form one corner, and economically they have strong complementarity. China needs Russia’s natural resources and latent science and technological power. Russia needs China’s capital and markets, especially its natural resource market. More and more Russians recognize that without China’s participation the successful development of Siberia and the Russian Far East is impossible. Third, the post-Cold War world balance of power and international strategic situation compels China and Russia to proceed together and to depend on each other, as I discuss in more detail below. The driving force in Sino-Russian relations is not only domestic on each side, but also foreign. Prior to 1945, the main external influence in Asia for both countries was Japan. After that date, right to the present, it has been the United States. After the collapse of the Soviet Union and Russia’s decision to lean to one side to the West, China carried no weight in Russian foreign policy. Yet, as it followed the United States, the radical reforms that were carried out domestically according to the script of the IMF and US specialists had serious counterproductive effects. Being the only remaining superpower, the United States did not respect Russia’s national interests. Its leaders began to recognize that only maintaining equilibrium between East and West would correspond to Russia’s national interests. This was the background in December 1992 when Yeltsin made his visit to China, but the Russo-US honeymoon period was not over, and talks with China did not touch on international questions. In 1995-1996, Russia was dispelled of the illusion that it would receive large-scale economic assistance from or become a real “strategic partner” of the United States. While it gave support to market reforms and a democratic transition, it treated Russia as a “latent opponent.” At this time, Clinton allowed Lee Teng-hui to make a private visit to the United States despite strong Chinese opposition and responded to Chinese missile drills in the Taiwan Strait by sending an aircraft carrier nearby, driving bilateral relations to the edge of crisis and prompting China to join Russia in raising the level of relations again. In 1999, with the US and NATO air attack on Serbia and the new NATO doctrine, great power relations, especially with China and Russia, were greatly set back. In the midst of national waves of anti-Americanism in both countries, their relations drew closer. After 9/11, the international situation, especially US unilateral militarism in using the slogan of counterterrorism to help to establish democracies aroused in China and Russia intense dissatisfaction and opposition. In March 2003, the United States bypassed the United Nations and violated international law by using trumped up charges to invade Iraq. In 2011, in the Libyan War the Western alliance led by the United States for the fourth time, counting the Afghan War, launched an attack on a sovereign state. The attack provoked a fierce reaction in China as in Russia. Whereas in the first half of the 1990s Chinese generally viewed the United States as democratic and just, by now it is seen as a “nation of savages.” Although it became mired in the quagmire of the Iraq War, it did not let up its pressure on Russia. Disregarding repeated protestations from Russia, in 2004 it welcomed the three Baltic states into NATO, causing NATO to expand into the territory of the former Soviet Union, reaching the Russian border. In 2006, it decided to establish an anti-missile system in Poland and the Czech Republic, causing Russia to feel even more threatened.3 In 2003-2004, the United States and Western countries took advantage of internal contradictions in Georgia and Ukraine to fan “rose” and “orange” revolutions and establish pro-West and anti-Russia “democratic regimes.” Russians saw this as isolating their country in Europe and making sure it could not revive as a great power for a long time. If it had happened, Russia would have been covered by a shadow. 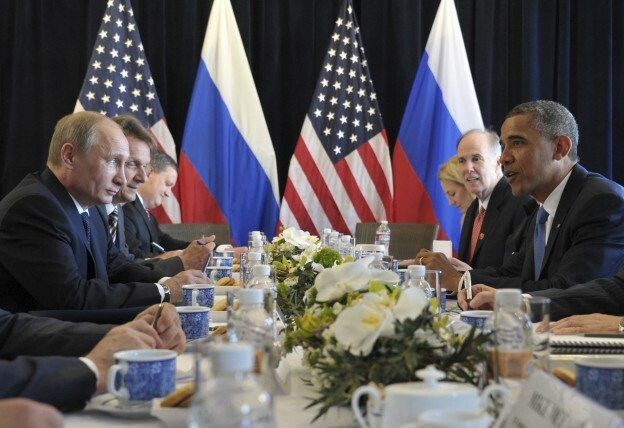 US interference in Russia’s internal affairs was a deep-seated cause of relations turning cold. After Putin took office he no longer took as a strategic goal entering the “great family of the Western civilized world.” Instead, he chose the path of independence and autonomy, striving on the basis of social and political stability to realize the development and prosperity of his state. The United States and other Western countries openly backed Russian opposition groups, criticizing Putin for “dictatorship” and “anti-democratic” ways, as well as for policies toward the CIS countries of “Sovietization” and “new imperialism,” all of which angered Moscow. Russia stresses independent decision-making on foreign and domestic policy, opposing outside interference, which is the same as the principle that China firmly upholds. On important principles related to the path of national development, China and Russia speak the same language, which not only serves to increase mutual understanding and trust, but also, in finding mutual lessons for reform and modernization, has important international significance. The political philosophy of China and Russia is diametrically opposed to that of US “democracy” promotion. As a Russian scholar observantly noted, “In relations with the West, especially as they concern one’s own path of political and cultural development, China can expect Russia’s support because Russia has encountered the same issues.”4 Moreover, Russo-US military competition has really not stopped. After entering the 21st century, Sino-US economic mutual dependence has grown ever greater. Although there are continuous frictions over Taiwan, Tibet, human rights, and other issues, bilateral relations are, on the whole, stable. Yet, after entering the 2010s, a big change has occurred in this relationship. In 2011, China’s GDP surpassed Japan’s as the world’s second largest. Facing a rising China, the United States seems to have dusted off its old playbook. In the same year, it announced its “pivot to Asia,” carrying out a “rebalancing strategy in the Asia-Pacific, the main contents of which are: 1) to adjust its military strategy and its military force structure, by putting the center of gravity in the Asia-Pacific, as seen in the plan to keep 60% of its naval forces there and in the Jan. 2012 “new defense strategy” that regards China as a latent war target; 2) to strengthen relations with Japan and other allies; 3) to tighten relations, including military cooperation, with India, Vietnam, and other states that have territorial disputes with China; and 4) through the TPP to grasp the initiative in regional economic cooperation. The East China Diaoyu (Senkaku) dispute between China and Japan, the island disputes in the South China Sea with Southeast Asian states, these are historical legacy problems. In circumstances of rising waves of nationalism in various countries, it is impossible for any politician to make one-sided concessions. That is why China continuously advocates “put aside the disputes,” “develop together.” Objectively speaking, this is extremely reasonable, extremely practical advice. Precisely because of this, the South China Sea and East Sea have been relatively stable for a considerable time. Yet, after the United States declared its “pivot to Asia” these historical legacy problems have quickly percolated, causing relations between the relevant countries and China to grow tense. Although the United States repeatedly declares that its “rebalancing strategy” is not targeted at China, this is already hard for people to believe. Especially US support for Japan’s expanded military force and plan to use Japan to balance China have provoked a strong reaction in the Chinese populace. Sino-Japanese relations are very distinctive. Japan’s invasion of China lasting half a century caused extreme harm to the Chinese nation, and until now the wounds of many families have still not healed. Therefore, the United States balancing China with Japan, which is unwilling to look squarely at and reflect on its history of invasions, arouses abhorrence and opposition from the entire Chinese nation. Apart from this, the world economic situation is pushing China and Russia ever closer. If Russia had tried to rely on Europe and the United States for outside assistance to realize its modernization, then given today’s retreat of their economies and the vigorous development of China’s, it is resting its hopes increasingly on China. The US 2008-2009 financial crisis and its continuing budget crisis have caused Russia and China to feel threatened in using the US dollar as their main reserve currency and basis of calculation. For the sake of self-protection both must undertake united action in order to reform the international economic order, including the financial system. Since the collapse of the financial system, Sino-Russian relations have developed extremely smoothly. With this kind of development momentum, for a considerable time to come relations cannot experience a reversal. Although inside Russia there can be found various kinds of “China threat theories,” and in China some people are still railing about the large slices of China’s territory that were carved away through unequal treaties with Tsarist Russia, these are not the mainstream of public opinion in either society, and they cannot influence decision-making in either government. The strategic cooperative partnership derives from the requirements of long-term national interests, first of all requirements for internal reform and development. If there were no threat from external factors, China and Russia, being two large neighbors, would not have any other choice apart from the long-term of good-neighbor, mutual interest cooperation. The United States is the main outside influence propelling the Sino-Russian partnership forward. Between China and Russia on the one hand and the United States on the other, there are some deep contradictions, which in the short term will be difficult to overcome. First, the United States, to prevent the appearance of a great power structural challenger, blocks any state from being able to keep up with it. In Europe it views Russia as a latent threat. Through the expansion of NATO to the east, it aims to contain Russia. In Asia it views China as a competitor, and through “rebalancing” it aims to contain China. Second, between Russia and the United States there is the CIS question. Russia is striving to reintegrate this region, restoring a sphere of influence in the region of the former Soviet Union, and the United States in order to block the restoration of the Soviet Union and the Russian empire is exerting its energy to solidify the situation resulting from the collapse of the Soviet Union. Between the United States and China there is the Taiwan question. In the most recent two years we can add to this the questions of islands in the South China Sea and East China Sea. Through interfering in these issues, the United States has caused trouble for China, hindering its development. Third, the United States considers China and Russia to be “authoritarian” states, often rebuking them from the standpoint of “democracy,” “human rights,” etc., provoking fierce rebuttals from them. Fourth, on the dimension of strategic nuclear arms, Russia strives, on the whole, to maintain equilibrium with the United States, but the latter connives to break the existing balance, to gain unilateral superiority. Through deploying anti-missile systems in Europe and Asia, it is posing a threat to China and Russia. Today’s triangular Sino-Russian-US relations are different from the Sino-Soviet-US triangle of the 1970s. At that time, the triangle of Soviet-US confrontation, Sino-Soviet confrontation, and joint Sino-US opposition to the Soviet Union was very simple. Today’s situation is comparatively complex. China and Russia are joined in containing the United States, but this is not confrontation. It is both competition and cooperation, and through competition achieving cooperative relations. As for politics and security, China and Russia in opposing US hegemony have common interests and similar points of view. They have cast aside the ideological factor and Cold War logic. In this sense, the level of development in Sino-Russian relations surpasses that in Russo-US relations. Yet, if we consider the level of economic and social closeness, Sino-US relations greatly surpass Sino-Russian relations. The tendency of economic globalization and world multipolarization cannot be blocked. The world seems to be in a transitional period. China, Russia, and the United States are all adjusting their foreign policies. China and the United States, simultaneous with competition and struggle, are searching hard to establish a new type of great power relations. Russia and the United States are striving to improve relations too. The Sino-Russia-US triangle is not without change. 1. Zhonge lianhe shengming, Kuashiji de zhanlue xuanze (Beijing: Xinhua chubanshe, 1999), 15. 2. E. Zanegin, “’Kozyrnaia karta’: Amerikansko-kitaiskie otnosheniia na geopoliticheskikh vesakh,” Pravda (February 1994): 3. 3. Inter’viu S. Rogova, Moskva i Vashinton: nestabil’noe partnerstvo,” Nezavisimaya gazeta (May 2006): 8. 4. Ia. M. Berger, “Opravdanie imeni—Global’naia strategiia Kitaia,” Nezavisimaya gazeta (June 2006): 13. 5. Evgenyi P. Bazhanov, “Ne boites’ Kitaiskogo drakon’: kak Rossiia stroit otnosheniias Podnebesnoi,” Nezavisimaya gazeta (August 2013). This is a very good article on Sino-Russian cooperation against the U.S. I agree with the views in the article.